We have some ideas for baby boy shower invitations that will make your announcement in a manner that is in keeping with the color scheme or theme of your celebration with wording that invites your guests to join in the fun! Some of our tips are cute and some may surprise you. For instance, those of you who are of the opinion that cheap or free printable downloads are the cheapest route to take might be in for a bit of a surprise. Not that I have anything against free baby boy invitations. I am well aware that there are times when you have no other choice but to design your own cards to get just the right wording or pictures. 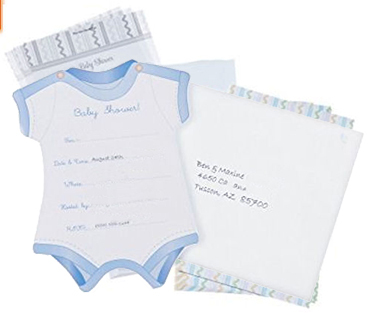 But, if you have one of the popular baby boy shower themes in mind it may be best to buy a couple of packages of generic invitations or use the ones that come as part of your baby shower decorations and tableware kit. 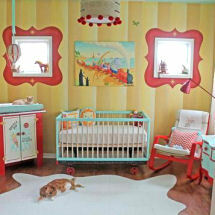 Take a look at the large selection of printable baby shower invitations that can be personalized. Once you figure the hours that you spend experimenting with endless baby clipart graphics, color layouts and ruining expensive card stock (I usually waste more than I end up printing) you may see that this method is actually more expensive than if you had ordered your cards or bought them ready made. Beautifully personalized, custom cards ordered from a printer online are currently available for as cheap as (at the time of this article) .99 each up to as much as 3.00 for a 5 X 7 inch flat card and envelope with colorful graphics, customized wording in the font of your choice and that has been embellished with a tied ribbon. My favorite places to find unique baby boy shower invitation ideas are Etsy stores and Ebay auctions. Ebay has some excellent examples that are comparable to those produced by online printers. There are some sellers who charge approximately $25 for their time to create personalized cards that you then print at home or take to your local photo lab for printing. This fee is for their graphic design services only, no colored ink, envelopes or card stock is included in the price. What you get is a graphic file that serves as a template. Etsy is another place to find one of a kind invitations for any occasion. There are so many examples of cute baby boy shower invitations that it would take me all day to make price comparisons so I will just mention that my favorite 4 X 6 baby shower invitation cost $6 including shipping for a package of 10. That price did not include envelopes which would cost another $4 for a package of six white envelopes. I’m sure that there are more inexpensive samples but I shopped for cards that were similar in quality to personalized invitations from a printer. These cards will be the discount shopper’s choice hands down whenever possible and for very good reason at less than fifty cents per card or less. The cheap price makes a compelling argument for choosing one of the popular styles that in many cases follow suit with the baby boys crib bedding set mom has picked out for the nursery. Most shower kits include at least eight invitations and envelopes with individual packages for sale along with additional party favors, thank you cards and tableware for showers with large guest lists. The time and effort that a hostess devotes to making unique, handmade invitations will always appreciated and her handiwork admired. But I hope that I have dispelled the myth that homemade baby boy shower invitations are cheaper to absolve busy, young moms of the guilt they may be experiencing because they felt they spent too much on ready made cards or simply chose not to make their own baby boy shower invitations. Please make plans to visit Unique Baby Gear Ideas again soon to see new boy baby shower invitations and the latest nursery ideas shared by our amazing visitors.